It has been over 2 years since we started our project to improve the facilities in Letham Park and create a beautiful park shelter for all of our community to enjoy. We have had our fair share of problems with gas pipes and changes in finances but it now looks as if things will be starting soon. The project is being funded by Fife Council, The Secret Garden Outdoor Nursery and The North Howe Transition Toun, who are contributing £10,000 to the project from the Lottery. In total our community has now raised the £70,142 necessary to make the project become a reality. Local architect Tom Morton has designed a stunning earth structure using ideas from our community consultations. This will be built by local earth building specialists Little and Davie who will be giving the community the opportunity to get their hands dirty and take part in a number of workshops. Details of these workshops will be made available over the next month. A planning amendment is being processed at the moment covering the change in location to avoid the gas pipe, and updated design, and a decision is due to be made on 28 June. 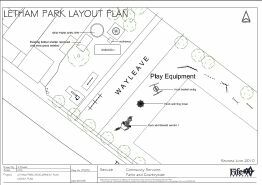 Once this has been confirmed the building work will start on the foundations of the shelter in July and the council hope to have the play equipment complete in Autumn of this year. We will continue to keep the community informed of progress via www.letham.org.uk and at community council meetings.